C1511 air operated hog ring gun. KHF brand. Similar to Bostitch SC50T. Designed for very large bag closure. 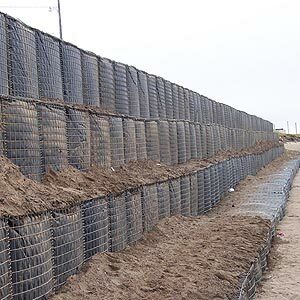 Also used for gabion baskets, commercial fencing, tree staking, etc. Uses 11 gauge 1-1/2-inch C-type rings. Rings come in sharp or blunt tip. Stainless steel, Aluminum and Galvanized rings available. Designed for long service life and easy maintenance through careful engineering. Benefits of using this tool can be seen immediately in less man hours on the job, lower occurrences of work-related injuries and lower cost per connection. Dimensions 20" x 13" x 8"
1-1/2-inch hog ring staples 11 Ga, Sharp. Aluminum. 1,600/box. 1-1/2-inch hog ring staples 11 Ga, Sharp. GalFan. 1,600/box.